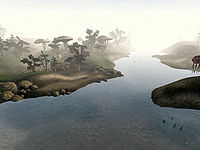 Lake Hairan was once a small lake just north of the city of Vivec, between that city and Pelagiad, in the heart of the Ascadian Isles. It was surrounded by farms and rich plantations under House Hlaalu control. At its northeastern end, the lake narrowed into a river channel that connected it to Lake Masobi. To the south, the lake merged with the vast lagoon encompassing Vivec. It's unclear whether any semblance of the lake survived the cataclysms of the Red Year in 4E 5.